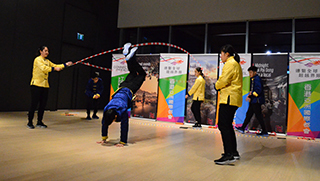 The event opened with a stellar performance by Hong Kong's Rope Skipping Team, where the group performed acrobatics, swift jumps and tricks using skipping ropes. 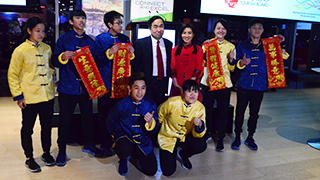 The Hong Kong Rope Skipping Team poses with Michael Lim, Hong Kong Tourism Board Director for Canada, Central & South Americas (red tie), and Emily Mo, Director of the Hong Kong Economic and Trade Office in Toronto (red dress). Mo (left) and Lim gave a toast to the Chinese New Year, the Year of the Pig. A record 65.1 million people visited Hong Kong last year, making it the most visited city in the world for the eighth consecutive year. 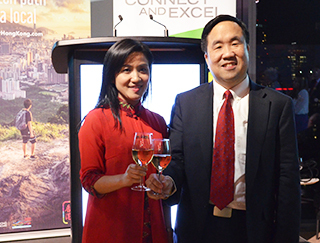 This milestone, as well as the Chinese New Year celebrating the Year of the Pig, were honoured at an event in downtown Toronto by the Hong Kong Tourism Board and The Hong Kong Economic and Trade Office (Toronto) on 8FEB. Michael Lim, the Hong Kong Tourism Board Director for Canada, Central & South Americas, also noted that the region welcomed over 377,000 Canadian visitors, a 2.1% growth over the previous year. Recognizing that traveller’s preferences are rapidly changing, the Hong Kong Tourism Board highlights that the destination offers a variety of experiences for all types of travellers, from the finest restaurants and bars, to cultural attractions, museums and outdoor adventures. Hong Kong’s distinctive cultural neighbourhoods offer a chance to explore heritage, food, art and hidden treasures. The Sham Shui Po neighbourhood district in Hong Kong’s Kowloon Peninsula, for example, is home to multiple historical sites, characteristic architecture, religious buildings and shopping malls. A promo video played at the event takes viewers on a time-lapse walk-along tour through the bustling markets, local shops and eatieries and nighttime viewscapes of Sham Shui Po. Ninety percent of Canadian travellers to Hong Kong want multi-destination itineraries, said Lim, which is why spotlighting the greater region is one of the tourism board’s key priorities in Canada. New infrastructure developments, particularly the Hong Kong extension on the High Speed Rail that connects the city to mainland China and the Hong Kong–Zhuhai–Macau Bridge, position the city as a gateway to countries including Taiwan, Vietnam and the rest of Asia. Lim called these infrastructure developments gamechangers for tourism in Hong Kong and the region. In another video aired at the event, a video collaboration with National Geographic, Hong Kong is getting word out that there’s more to the city life than skyscrapers and commercial centres. Even nature lovers will be amazed by Hong Kong’s UNESCO Global Geopark, large countryside and spanning seascape, all within 30 to 60 minutes of the city. Hong Kong is renowned for doing festivals without an ounce of reserve or moderation, hosting some of the best and largest celebrations – like the Rugby Sevens sporting event in April or the quintessential Dragon Boat Carnival in June which even has a team from Toronto participating this year. Check out the tourism board’s calendar to see which festivals are taking place when you or your clients are visiting. Lim said there are also new visitor tours that will show the diversity and flavours of Hong Kong’s New Territories, the region alongside Hong Kong Island and the Kowloon Peninsula. In accommodation, Lim announced that Hong Kong will be adding approximately 20 new hotels to its current market of more than 290 hotels and 82,000 rooms to sell to the world.